1 of your 5 a day. 100% natural ingredients with no added sugar or syrups. This product only contains naturally occuring sugars. Gluten, wheat & dairy free. Cold-pressed, never baked. 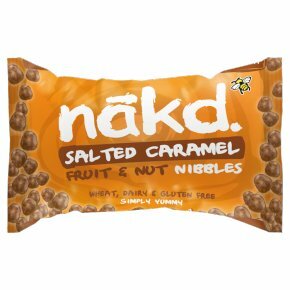 100% Vegan.Smooth, sweet and oh so luxurious, N?kd Salted Caramel Nibbles are the Rolls Royce of healthy snacking and are every bit as tasty as their confectionary counterparts. Who would have thought something so small could be so tasty! The best part is that these little lovelies are completely natural, meaning that you can munch away without a care in the world.